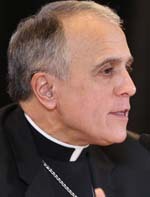 Cardinal Daniel N. DiNardo, Archbishop of Galveston-Houston and president of the United States Conference of Catholic Bishops (USCCB), responded May 4 to President Donald J. Trump’s executive order on religious freedom and the “HHS mandate.” The mandate issued by the federal Department of Health and Human Services requires most religious employers to provide coverage of artificial birth control for their employees even if they morally oppose it. Read more about the signing in Washington, D.C., here. “Today’s executive order begins the process of alleviating the serious burden of the HHS mandate. We will engage with the administration to ensure that adequate relief is provided to those with deeply held religious beliefs about some of the drugs, devices and surgical procedures that HHS has sought to require people of faith to facilitate over the last several years. “We welcome a decision to provide a broad religious exemption to the HHS mandate, but will have to review the details of any regulatory proposals. In recent years, people of faith have experienced pressing restrictions on religious freedom from both the federal government and state governments that receive federal funding. For example, in areas as diverse as adoption, education, health care and other social services, widely held moral and religious beliefs, especially regarding the protection of human life as well as preserving marriage and family, have been maligned in recent years as bigotry or hostility — and penalized accordingly. “But disagreement on moral and religious issues is not discrimination; instead, it is the inevitable and desirable fruit of a free, civil society marked by genuine religious diversity.